In an effort to preempt the transport groups from staging a potentially massive strike, President Benigno S. Aquino III last week held a dialog with the leaders of the transport sector. Malacañang was partly successful as only the Pinagkaisang Samahan ng mga Tsuper at Opereytor Nationwide (PISTON) went ahead with the transport strike last Sep. 19 while the others backed out. PISTON was supported by fellow progressive people’s organizations which staged mass protests in various parts of Metro Manila. Transport strikes and people’s protests were also held in various parts of Southern Luzon and Mindanao, where transportation was crippled. Presidential spokesperson Edwin Lacierda said that Malacañang is dismayed that PISTON still pushed through with the transport strike despite the dialog even as he claimed that very few passengers were affected. He also chided the transport group for opting to be part of the problem and not of the solution. Meanwhile, Secretary Mar Roxas of the Department of Transportation and Communications (DOTC) visited the protesters not to express sympathy but to tell them in person that the strike was “perwisyo” (nuisance) to the public. Lacierda’s and Roxas’s statements speak volumes about how the Aquino administration appreciates the problem of exorbitant oil prices and the plight of ordinary people like the jeepney drivers. manhid sa daing ng taumbayan” supposedly ended last June 30, 2010. But like its predecessor, the Aquino administration is proving to be as arrogant and as insensitive to the legitimate grievances of the people. It is proving to be as repressive, too. The Land Transportation Franchising and Regulatory Board (LTFRB) is reportedly reviewing the franchise of PISTON members who joined the transport strike. All this casts doubts on the sincerity of the Aquino administration to have another look at the Oil Deregulation Law as promised by the President during the dialog with transport groups. As Malacañang’s response to the transport strike, Roxas has announced that government has formed a task force composed of the DOTC, the Department of Energy (DOE), and the Department of Justice (DOJ) to probe “questionable collaboration” among oil firms in setting prices. “The task force will investigate how oil companies come up with market oil price, particularly how much they actually spend to import the product from oil cartels in the Middle East, transfer it via Singapore or other routes, and load the products into gasoline trucks before they reach oil gas stations,” said Roxas. investigation of Republic Act (RA) 8479. To be sure, an investigation of the pricing scheme of the oil companies should form an important aspect ofthe review but it should not be the only focus. The review must also seek to answer equally important issues such as whether or not the monopoly of the so-called Big Three (Petron Corporation, Pilipinas Shell, and Chevron Philippines) has been dismantled under deregulation. These issues can only be pursued through an exhaustive review which should be open to exploring alternatives including the repeal of the Oil Deregulation Law and instituting effective state control over the oil industry. Furthermore, the review must immediately translate to legislation given the urgency and magnitude of the problem. As such, the review should not be left to the agencies of the Executive branch alone. Instead, it must be a joint effort of Malacañang and the Energy Committees of the House of Representatives and the Senate where there are already pending proposals on what to do with RA 8479 such as House Bill (HB) 4355. This shall fast track the process and ensures that the results of the review will quickly translate to concrete policies, not to mention that government can even save on its meager resources. If Aquino truly wants to review the law, he should muster the support of his party mates and allies in Congress to immediately act on the pending bills. Also, the process should be as democratic as possible and must seek the participation of people’s organizations including the transport sector, workers, farmers, consumers, women, and youth. It must also include independent experts from non-government advocacy groups of academics, researchers, economists, and scientists among others. Otherwise, Aquino’s review order will just end up like the last review of the deregulation policy conducted in 2005. The Independent Review Committee created by Arroyo ended up dismissing all the issues raised against RA 8479 and bolstered criticisms that the initiative was nothing but a moro-moro to reaffirm the legitimacy of the much-criticized deregulation policy. The Aquino administration must recognize that the “proper” implementation of RA 8479 or even amending it to supposedly give the DOE more power to police the oil firms will not address the problem. One particular contentious issue is overpricing, a persistent allegation that has long been hounding the oil firms. Any deregulation law will not have a provision on overpricing because deregulation assumes that the market and competition will set the “fair” price. But this is a fallacy especially in the case of the oil industry which since time immemorial has been dominated and controlled by the monopoly of giant companies from the US and Europe. To curb overpricing and ensure reasonable prices at the pump, there must be a system of public hearing before any increase in prices is made. Unlike today when oil companies can automatically increase their prices – whether monthly, weekly or even daily – effective regulation will require them to justify the oil price hike up to the last centavo. In addition, the government must also have an active role in the importation, storage, refining, and retailing of petroleum products. To effectively regulate the oil industry including the determination of prices, the public needs to know where the petroleum imports come from, how much were they bought, in what quantity, etc. – details that are hidden from the consumers under the current set-up of decentralized importation. Centralized procurement of oil imports – even if gradually implemented based on available government resources – will help correct this defect. The government must also buy back Petron to better ensure reasonable prices and stable supply of oil products. Other key reforms include the establishment of an oil price and supply buffer fund that should cushion the impact of drastic increases in global prices on local petroleum products. Is the Aquino administration ready and willing to consider these policy reforms in lieu of the Oil Deregulation Law? Aquino has already demonstrated his strong bias for neoliberal free market policies. He has earlier rejected calls for price control and junking of RA 8479 amid public clamor for substantial government intervention as pump prices skyrocketed in the first quarter of the year. Instead, Aquino implemented the much-hyped but severely lacking P300-million Pantawid Pasada fuel subsidy. It also turned out that only P70 million has been released so far for the said program since it was launched five months ago. Indeed, reconsidering the deregulation law has never been in the agenda of the Aquino administration. It was not, for instance, included in the priority bills – even the proposals to amend RA 8479 – that Malacañang submitted to the Legislative-Executive Development Advisory Council (LEDAC) during its first meeting under Aquino last March. At that time, oil prices were soaring at an alarming pace, threatening to duplicate the oil crisis in early 2008. Aquino only ordered a review of the Oil Deregulation Law after PISTON and other transport groups threatened to stage a strike against unreasonable oil prices and the lack of state regulation. 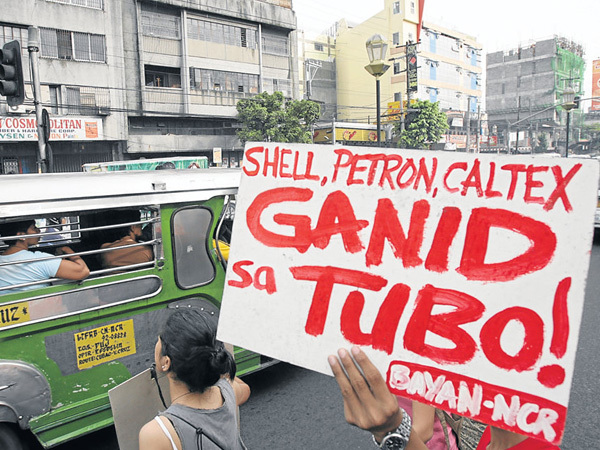 PISTON’s decision to still push through with the transport strike even after the dialog underscored the message that Aquino should not pay lip service to the people’s longstanding demand to control petroleum prices.